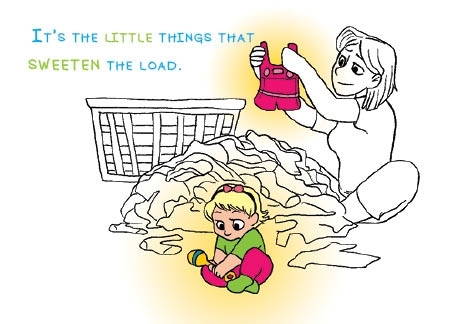 Laundry is a necessary part of a mother's duty - but OH how adorable the little baby clothes are. "It's the little things that sweeten the load." Reads the New Baby card illustrated by Brenna Kielty. 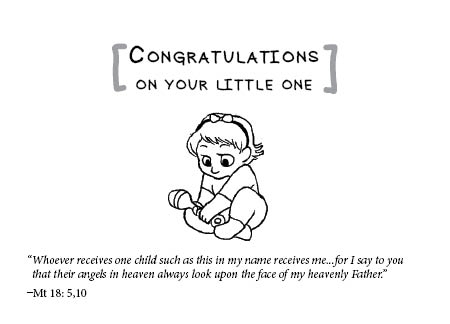 The inside salutation is "Congratulations on your little one. 'Whoever receives one child such as this in my name receives me...for I say to you tht their angels in heaven always look upon the face of my heavenly Father.' Mt 18, 5,10.'"